Perhaps even more so than Chinese cuisine in Britain, Indian food and restaurants have evolved massively over the past few centuries. Britain’s first encounters with the food of India can be traced back to the 17th century with the introduction of The East India Company. Set up for Britain to trade produce with India, this sparked further interest in Indian food, with various spices and curry powders becoming readily available in the UK during the late 1700s. As for Indian restaurants, London’s first dedicated curry house – a short-lived Hindostanee Coffee House – was opened in 1809, though it was Veerswamy in Regent Street that became the first truly popular curry house in London. During the 1940s, a boom in popularity of these Indian restaurants saw many more openings across the country, followed by even more openings in the ‘70s. These curry houses were especially popular amongst those looking to carry on drinking after the pubs had closed. It was also around this time that so many of the ‘Indian’ dishes known and loved in the UK were created especially for the English palate. As Brits, we are to blame for dishes such as the generally morbid chicken tikka masala with its lurid red sauce, allegedly invented in Glasgow for a diner who complained about their chicken being too dry. Legend has it that a sauce was then concocted from gravy, yogurt and a tin of tomato soup. In more recent years, Indian cooking has diversified further and though thousands of stereotypical curry houses are still operating across the country, a huge number of chefs have pushed boundaries and opened high-end restaurants to showcase a more authentic, inventive slant on Indian cooking and flavours. Bombay Brasserie in Gloucester Road was pioneering in this particular movement, soon followed by the likes of Tamarind and Zaika. The latter was opened in the late 1990s and soon became one of first Indian restaurants in the world to be awarded a Michelin Star under the guidance of Head Chef Vineet Bhatia. In 2004, Bhatia left Zaika to open Rasoi, a very classic high-end Indian restaurant in Chelsea. 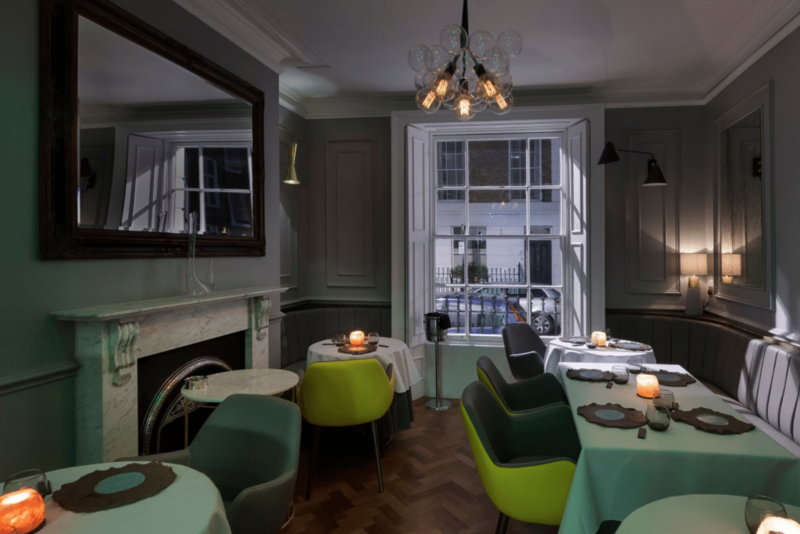 Following a refurbishment throughout the summer, the restaurant has recently re-opened with a brand new name and direction – with prominent focus on modern Indian-inspired cooking that pushes boundaries and generally excites. Inside, the townhouse building has a warm, homely ambience, accessed by ringing the bell of a locked front door. Open only for dinner, the restaurant’s food offering is exclusively from a tasting menu of sixteen dishes to send diners on a multi-sensory culinary excursion. We begin with a selection of appetisers, including the likes of a golf ball-sized structure of aloot chat, formed from strips of fried potato and served with a yoghurt-filled pipette that’s intended to be piped into the potato sphere. Rich pao bhaji, a sweet brioche-like bun is filled with potato and joined with a subtly spiced round of bhaji butter, tasting best when placed atop the bun to melt. This is amongst the best of the sixteen dishes on offer here. A Sago Papad cracker, on the other hand has a topping that combines the clean, fresh taste of raw tuna with the sweet, sometimes sickly taste of mango chutney to deliver an unexpected taste sensation, while a halved scallop seared in ghee has a deep caramelised outer and a promising softness inside, accompanied by complimentary edamame beans and a small bed of pearl cous cous. Like many of the other dishes on the menu, this is served on a hyper-modern plate replacement – a visually striking bowl that resembles tin foil-wrapped coral. Mushroom momo, on the other hand, arrives on an intentionally broken plate, comprising a fried dumpling that’s filled with mushroom that’s finely diced and has a prominent earth taste, while the chef’s new twist on his classic tandoori-smoked salmon with a spiced dill marinade is, here, delivered beneath a glass cloche with sweet pea powder and a dribble of cucumber ketchup. Like the momo, although miniscule, the salmon is a remarkably accomplished dish that works especially well with the paired glass of Alsatian Riesling. The grilled lobster is one of the most accomplished dishes here, in terms of ingredients and presentation. There is a lightly spiced sauce so to avoid overpowering the lobster, sweet-sour baby watermelons and a black foam that’s made using squid ink. Alas, the halved lobster tail and claw is slightly overcooked and thus tougher than ideal. 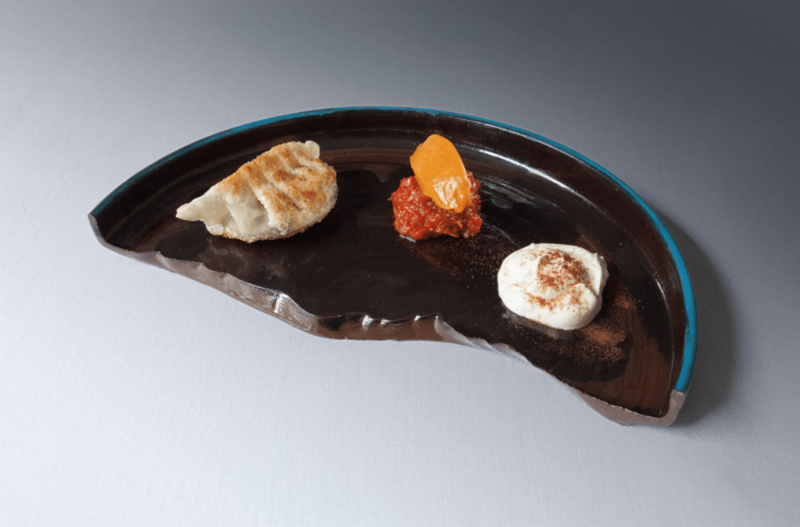 In addition, the foam – although visually alluring – added very little to the dish in terms of flavour. Far better is a contemporary riff on classic Malai chicken with its creamy sauce that compliments the expertly grilled portion of chicken, but without an overabundance of lactic acid to overpower the delicate spicing of the dish. Better still, Kapi lamb chop is served on the bone (it is necessary to pick it up and gnaw like a scavenging vulture, no matter how uncivilised) and slowly cooked with a rub of bitter coffee and contrastingly sweet jaggery (cane sugar) to bring an extreme richness that’s also spiced with a focus on flavour, juxtaposed to heat. The tasting menu comes to a finale with a pre-dessert and not one, but two desserts. First, the ‘coconut calm’ is unsurprisingly heavy on sweetness, with textures of milky coconut intended to act as a palate cleanser. A block of Himalayan salt would have been more attractive had it not been served atop a slate. This particular dessert comprises a cylinder of caramel kulfi with umami sesame snaps that neutralise the dish’s overall sweetness. It’s the ‘chocomosa’ on offer, however, that’s the most enjoyable – it is Bhatia’s take on a classic samosa, albeit filled with rich milk chocolate that works as an astonishing end to the meal. Although lengthy and expensive (£105 without wines), Vineet Bhatia’s expertly concocted tasting menu offers food that continues to showcase his renowned cooking skill, alongside acting as another step towards further pioneering food with Indian influence. Vineet Bhatia can be found at 10 Lincoln Street, London, SW3 2TS.